After arriving at the Central Station in Stockholm following a super quick trip from ARN, I quickly found my hotel. I walked in the front door at 08h00 and found one person working the check-in desk. No one else was in the lobby either. I was afraid that I wouldn’t be allowed to check-in until 3pm, which is almost always a devastating way to start a trip like this. I love a quick shower and a little nap upon arrival. The gentleman who checked me in seemed quite excited that this was my first visit to Stockholm and that I chose to stay with them. He was also fascinated with the idea that I was coming in for a January vacation for just 2 days then returning. He recognized my Platinum Status, thanked me for my loyalty and pro-actively upgraded me to a Junior Suite with a separate living room. I decided to take the extra 500 points as my welcome amenity, in lieu of the local gift. Continental breakfast in the restaurant was also provided (or I could take it in the lounge, which was more private but had less options). Before departing the front desk to explore my room, I asked the gentleman at the front desk for recommendations on things to do in Stockholm. Without missing a beat he said I had to have Meatballs and Herring (duh), visit the old town area (Gamla Stan) and go see the Vasa Museum (more on that later). I took him up on all his suggestions, which were great. I made my way to my room, which was sleek, modern (although a bit old and dated — if that makes any sense). You walk into the separate living area, which had a couch, a chair and a TV — making it a quite comfortable area to relax with friends (if not traveling alone). Continuing on, a connecting hallway had a closet on the left and the entrance to the bathroom across from it. 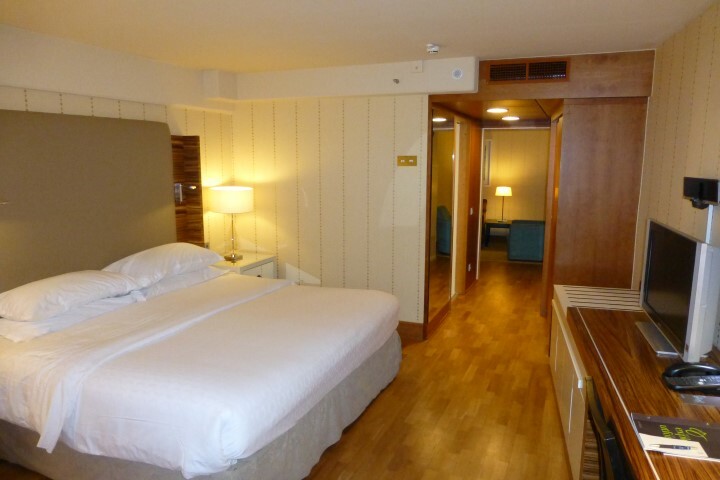 The bedroom, with a king bed, separate seating area and desk, was at the end of this small hallway. 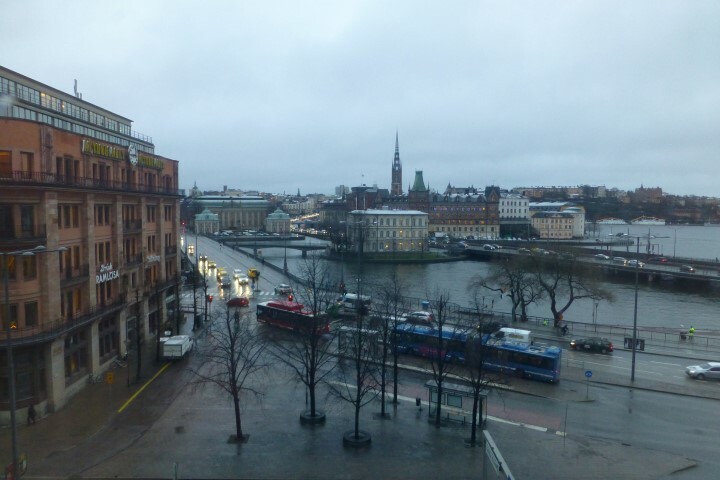 The view from the room looked out on Gamla Stan. 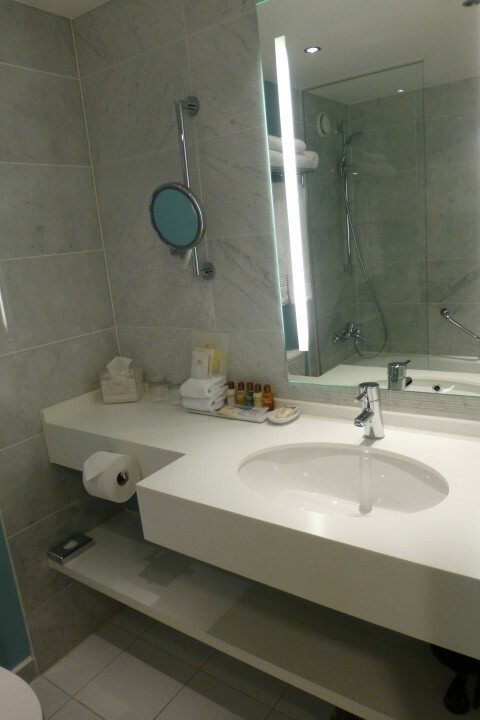 The bathroom was small, but equipped with a tub and a shower and a vanity. 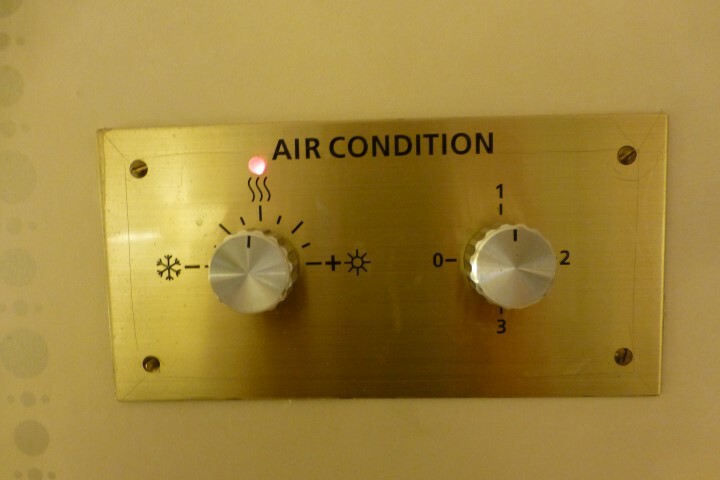 I walked in the room at 08h15, less than an hour from touchdown at ARN and was taking a lovely scalding hot shower. 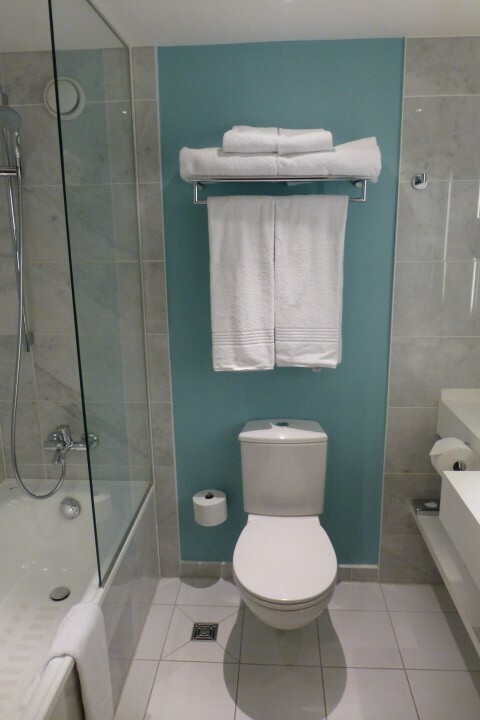 You’ve got to love a City where you can get from your seat in the economy section of the plane to a shower at your hotel in less than on hour – isn’t that the first world travel dream? 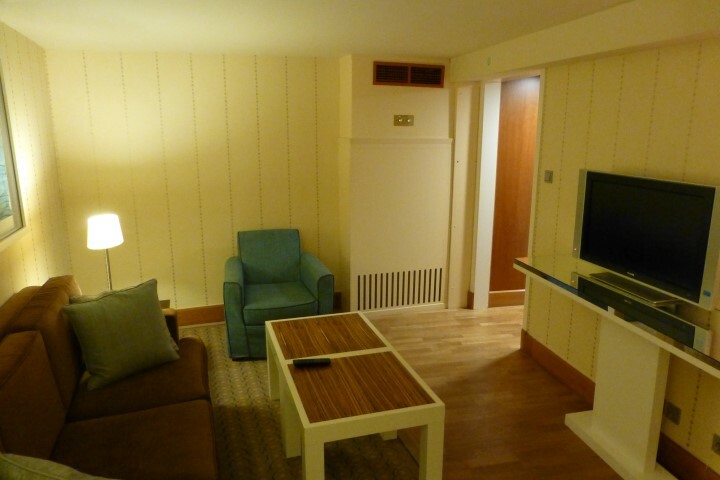 It was great to get an upgrade to a suite, but honestly, I didn’t use the living area at all. I was in the room a bit, but when not sleeping, hung out mostly in the bedroom area. If traveling with others this extra space would have been great though. 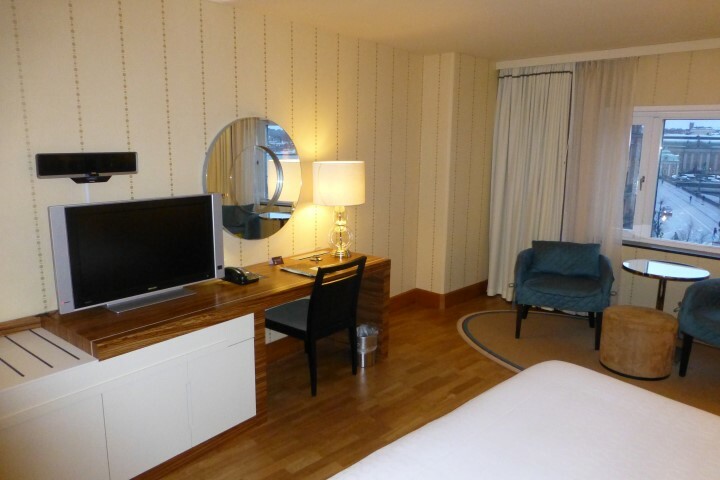 Plus, I do appreciate the complimentary Platinum room upgrade without having to beg/plead/bargain or cry to get it. I ate breakfast in the hotel restaurant (complimentary, again because of Platinum status) upon arrival on Friday then again on Saturday. Unfortunately, it opened too late on Sunday so I couldn’t go again before my flight. I’m not a buffet guy in general, but the spread was pretty good for a European breakfast (now those Asian breakfast buffets are quite fab). The spread included everything from pancakes, to french toast, to berries and various meats (ham, turkey and what looked and mildly tasted like Jamon Iberico). There was also the standard muesli and yogurt as well. Like most hotel buffets, under normal circumstances, I would never pay for them, but if they are complimentary, I’ll give it a go. This one was well done and the breakfast room wasn’t overly crowded (again, probably because there aren’t a lot of people staying at the Sheraton in Stockholm on a weekend in January. 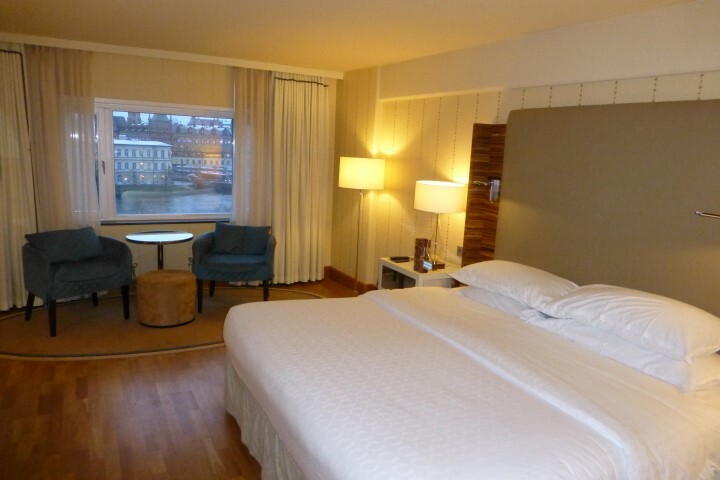 All in all, I’d say the Sheraton in Stockholm was definitely worth a revisit, if I’m back in the area. I chose it only because it was the only Starwood property in the City (there are only two in all of Scandinavia – Helsinki is home to the other). The service was top notch, the location couldn’t be beat and the price was right. Speaking of price, the Sheraton Stockholm Hotel is a category 5 property which was going for approximately $145/night during my stay. I decided to cash in 12,000 Starpoints each night for this stay. This is far from a stellar redemption option, earning only $0.012 per point. What was my rationale for redeeming at such a low value? Well, I had a ton of Starpoints and Sweden in general is quite expensive, so I decided to save the nearly $300 in hotel costs and put that towards beer, meatballs and museum entrances. I’m happy with my decision — and as always, your internal points vs. cash discussion may end in a different way for you. When visiting Stockholm where did you stay? Do you prefer to earn/redeem points at chain hotels or stay in smaller boutique hotels or B&Bs? Where would you recommend someone staying whilst in Stokholm? By Tim in Travel on August 4, 2014 .